Given the choice of where to wander in New Jersey, I'll always go for the Delaware Bayshore region. Miles and miles of mostly flat surface brings farmland, small towns and sparsely populated marshlands. Driving is effortless, and it's easy to get lost if you don't know where you're going. Usually I go by instinct, and while I get lost from time to time, I've always found my way back home. I've been itching to head back down to Cumberland County, but our southern jaunts tend to be dominated by birding at Cape May or Brigantine. With Ivan out of state on a chase, this past weekend was the perfect opportunity for me to get up early and hit the road before the rest of the world had wiped the sleep from its eyes. My goal: reach the end of the Turnpike by 9 a.m. and wander for the bulk of the day. I was headed for the nether-reaches of the state: the area you really can't reach quickly from the Parkway or the Turnpike. Look at the map and you'll see what I mean. You'll spend a good hour on secondary state highways and then you'll end up in the middle of nowhere. "What exit?" means nothing there. The area is rife with long county roads with hyphenated names that refer to the end points. Having been there so many times, I was stuck with the dilemma of exactly which spots to highlight. I have a few old favorites I've visited repeatedly. There are other places I've yet to find, though I have a good idea where they might be. In the end, I chose to stick with the familiar and leave the new places to future jaunts. And, true to fashion, I got lost. I saw a familiar road name and made the turn, only to recall five miles later that it was the same wrong turn I always make. (Note to self: Buckshutem Road = stay on the other road.) While it didn't get me to my intended first stop, it got me someplace equally as interesting. 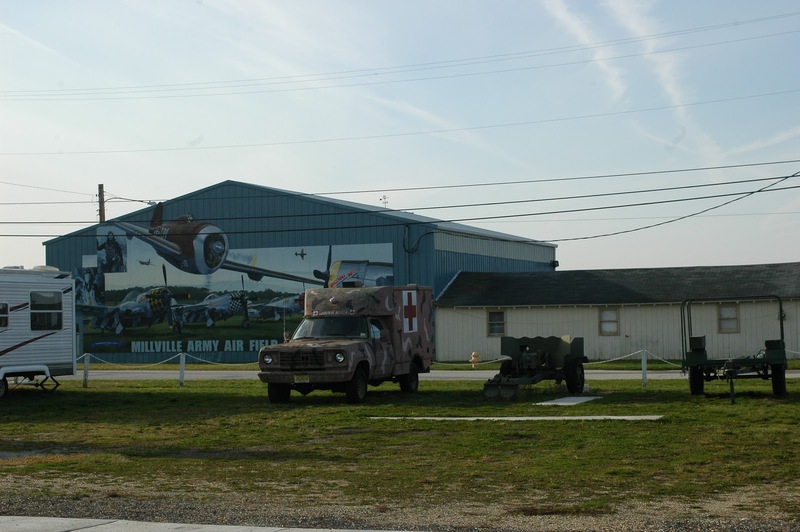 Millville is known for a bunch of interesting things: glassmaking, a historic village, and the Millville Army Air Field Museum. Contained within a commercial airfield that's still in use, the museum commemorates and celebrates the nation's first defense airport, opened in 1941. More than 10,000 soldiers and civilians, men and women, were stationed at Millville at some point during World War II, and 1500 of them were trained there for advanced air fighting. The museum tells their story while also relating military air history from the later conflicts in Korea and Vietnam. For such a quiet and out-of-the-way place, the Air Field Museum has a surprising wealth of artifacts and research materials. I first visited about ten years ago and was impressed by the collection of World War II memorabilia, but the collection has grown substantially since then. Students of 20th and 21st century American military engagements can research their interests at the Henry Wyble Historic Research Library and Education Center. Seaplane enthusiasts will be especially interested in the Philadelphia Seaplane Base Museum, which includes artifacts from the early days of flight to the present. 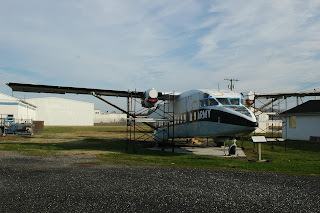 Outside, you're welcome to walk right up to a collection of unrestored mid-century military equipment and aircraft, including a C-23 Sherpa that served the Kwajalein Atoll in the Marshall Islands. Once a year, the museum also hosts the Wheels & Wings Airshow that includes other vintage aircraft and often hosts premier U.S. armed forces aerobatic teams like the Navy Blue Angels and Air Force Thunderbirds. The skies over Millville may no longer buzz with the traffic of military pilots in training, but it still holds an important place in aviation history.